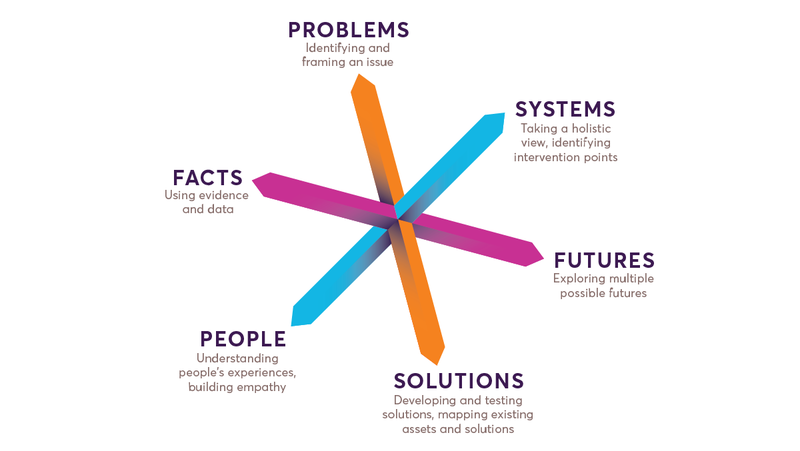 The key principles that help governments to unlock and explore the unobvious, and ultimately improve their problem-solving abilities. This blog post is the third part of a series that shares our reflections on building an experimental culture in governments - see Exploring the unobvious: An overview for an introduction. In the previous blog post, we discussed how innovation methods can help explore the unobvious. But we also argued we have to go beyond methods and focus on building a mindset that allows us to explore unobvious solutions in a much more systematic way. The question is how do we apply this broader perspective on innovation approaches? These principles cut across various – and the most proven – innovation methods (e.g. design thinking, systems thinking, futures and foresight, data, evidence based policy making, behavioural insights). They also describe practice areas that new methods are changing in government. We see these principles as habits and mindsets that are essential to policy or programme design activities and public problem solving. They help change how we perceive and frame reality, and prompt us to explore different solution spaces and prepare for multiple futures. They offer various perspectives on an issue, and help to identify knowledge gaps, challenge assumptions and generate richer understanding in order to make better informed decisions. They are at the core of using an experimental approach, which moves from exploring options to testing and then validating solutions. Essentially these principles help us identify and challenge our social, cognitive and emotional biases. The tricky thing is that we are often not aware of these biases, and we have to push ourselves to identify and effectively mitigate them. The principles are grouped in pairs, showing the contrasting dynamics that need to be managed effectively. The principles describe different areas of focus that government officials should be able to effectively toggle between when making innovation happen in government. The principles are used throughout the innovation journey, which in practice often manifests itself as a non-linear or iterative process, covering all principles and moving back and forth between them. Toggling between all six principles helps to challenge ingrained “success” models and stretch entrenched “best” practices by exploring more of the unobvious than one single innovation method can do. Insights are generated by zooming in and out between different levels, starting from people’s experiences up to a holistic big picture view. Reinventing government practice around people and systems focuses on new ways of engaging, understanding and working with people in order to enable user-centred innovation, while at the same time applying a holistic perspective to identify causes and interventions at the system-level to ensure sustainable outcomes and promote ownership. It involves managing the tension between the fine detail, such as the personal implications of a problem for a citizen, and how this fits into the wider picture, and vice versa. Managing this dynamic and exploring these different levels builds on a range of activities, varying from ethnographic techniques (e.g. interviewing, observations), to stakeholder analysis and network mapping, to modeling and mapping systems. Ethnographic techniques help to build empathy with the people who are directly or indirectly affected by a problem or solution. They intend to put people at the centre of decision making, creating a better fit between people and solutions. Whereas other tools and activities aim to explore and make sense of broader system dynamics, by looking at the wider context (e.g. social and cultural behaviour, actor networks, technology platforms, policies, service systems, etc.) and by identifying contributing factors, causal loops and potential or non-obvious intervention points. Decision making is informed by toggling between “what is”, by using data and evidence, and “what could become”, by imagining multiple possible futures. Reinventing government practice around facts and futures focuses on effectively using (new) knowledge, data and evidence to make better informed decisions, while simultaneously imagining and anticipating multiple possible futures in order to prepare for them. It involves managing the tension of justifying decisions based on both “hard facts” and imagination; using different kinds of knowledge and disparate data points that relate to the past, present and future. Managing this dynamic requires a range of tools and activities, varying from using data analytics to identify trends, to using storytelling techniques to generate new understanding. On one hand, research evidence and rigorous experimental methods such as randomised controlled trials are used to validate solutions and to build a solid evidence base. On the other hand, foresight, horizon scanning and speculative design are used to explore and create visions of multiple possible futures. The purpose of these future oriented methods is not to predict the future, but to help us prepare for it and shape it – only to some extent of course. Solutions are developed through a process of framing, finding and testing that involves exploring both the problem and solution space. Reinventing government practice around problems and solutions involves a different relationship between the two spaces, one that is more interactive and interdependent. Problems are explored through new lenses (i.e. frames) to create new perspectives and open up opportunities, while solutions are developed through trial and error to find out what works, or by finding existing solutions that already work and learning from them. It involves managing the tension between exploring and developing the problem and solution space by interactively moving back and forth between the two spaces. Both spaces should co-evolve, as opposed to the traditional approach where problem analysis often plays a prominent initial role. Managing this dynamic builds on a range of activities, including: root cause analysis, problem framing and reframing, prototyping, co-creation, user or community led approaches (e.g. need-solution pairing, positive deviance, asset mapping), and reusing or reverse engineering existing solutions from other government agencies or the private sector. The majority of these techniques, particularly prototyping and reverse engineering, are intended to drive down development costs and minimise the risk of a “big bang” failure, by failing fast and early, iterating and improving ideas, or by learning from someone else’s mistakes and successes. Different approaches can also be used to explore the unobvious. For example, with positive deviance, outliers are deliberately sought out (e.g. InWithForward’s newsletter features a “positive deviant” in every issue). In need-solution pairing, the focus shifts from problem formulation to finding possible solutions, which on discovery are then usually paired with a need (see for example Patient Innovation or the Red Cross’ lead user innovation research on floods in Indonesia). Alternatively, asset mapping looks at the resources, skills and talents that already exist in a community or context of the problem, and that could constitute a solution (see for example the work of India’s National Innovation Foundation). These solution focused approaches are currently still uncommon practice, but there is value in considering them; they lower development costs, reduce (cognitive) biases and eliminate constraints that inherently dominate problem-focused processes. In this series of posts we have tried to describe some of our recent thinking on innovation practice. We have argued that in order for governments to become more effective at public problem solving, they need to move beyond mere methods and tools and focus on experimental mindsets that deliberately explore the unobvious. We have presented six principles that drive and accelerate this process. Currently we are using these principles as a framework to put our competency framework for public innovation into practice (particularly the skills around “accelerating learning”) and – in keeping with Frank Lloyd Wright’s maxim “Do not try to teach design, teach principles”– to build the curriculum for our States of Change learning programme. We are well aware that at this stage these ideas might sound rather abstract or theoretical. Through our R&D work we are working to test them in practice, and you can keep up to date with that on the States of Change website. But in the meantime we are curious to hear how they resonate with you, and how they might help you make sense of your own innovation practice.